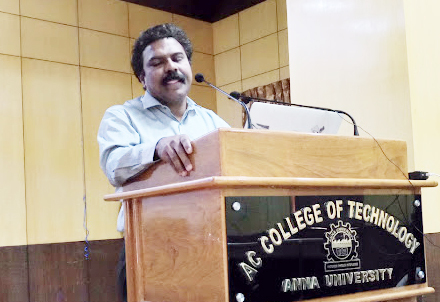 Digital Security Association of India (DiSAI) organised a full day workshop on 'Securing the digital space' on 6th Jan 2018 at Anna University, Chennai. Dr Santhosh Babu IAS, Chairman of Tamil nadu Handicrafts Corporation Limited and former IT Secretary of Government of Tamil Nadu made a presentation on digital security in governance. Please watch his presentation. Hello, I Completly agree with this, education can be an extremely appealing option for so many people. Here at https://typicalstudent.org/hot/students-life/haunted-abandoned-places-in-usa-for-students-to-visit-summer-2018 you will get such type of information. Information is very informative also you get same from https://typicalstudent.org/hot/students-life/haunted-abandoned-places-in-usa-for-students-to-visit-summer-2018, this is the great resource to get such type of information about university education. · Candidates need to appear for the entrance test SRMHCMAT conducted by SRM University and on the basis of the rank obtained in SRMHCMAT and marks obtained in 12th standard, admission will be processed. What a fantabulous post this has been.I am grateful to you and expect more number of posts like these. Thank you very much. Excellent work! I really enjoyed it you have shared in this blog. Keep on sharing the posts like this. Digital Security Association of India (DiSAI) is a non-profit Public Trust and NGO (Non-Government Organisation), with Trustees on its board, holding expertise in technology and the academic field. This is the fourth initiative of eMagazine PreSense. V. Rajendran, Editor of PreSense, is the Founder and Chairman of DiSAI. Prof. Dr R. Jagannathan, Editorial Advisor of PreSense, and former Vice-Chancellor of the Middle East University, UAE and the American Medical University, West Indies, is the President of the new initiative. Presently, the world is talking about Computer Security, Network Security, Internet Security, System Security, Information security and Cyber Security. With technology penetration in all walks of life, impacting human life globally, safety and security of data in communication including the other aspects associated with life namely, ethical security, societal security, and legal security assume greater significance. DiSAI will embark on a new journey in this direction focussing in this niche area of digital security, involving all the stake holders in the area. Those interested in getting associated with the initiative, irrespective of their location, may email to Shri V Rajendran, Chairman, DiSAI at info@disai.in or disai.india@gmail.com.